The articles in this issue of IJWP are related to the cultural consciousness that influences group-on-group violence. The pursuit of group interest with disregard to the interests of other groups can either be the willful result of selfishness or actions based on ignorance of the situation of other groups. The photos of the body of the three-year-old son of Syrian Abdullah Kurdi washed up on a Turkish beach helped fuel a campaign for global sympathy for refugees fleeing war-torn areas in Syria, Iraq, and Afghanistan. This sympathy increased pressure on states to receive more refugees and for reform of bureaucratic practices. Refugees make dangerous illegal trips in which the death rate is high because red tape can make legal immigrants wait for years. This news promoted by global media raised global consciousness of the plight of others who are suffering an undeserved fate, and helped to encourage compassion for members of other groups. The result was increased quotas for refugees adopted by many countries, although few solutions to solve the systemic violence causing the refugees to flee were promoted by the media. It is clear that the media and globalization have a major impact on the fate of people who a century ago would never have been known to the larger world. However, the media often promote elite interests that lead to group conflict. 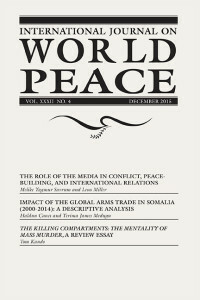 The first article, “The Role of Media in Conflict, Peacebuilding, and International Relations,” argues that content analysis verifies that established media tend to promote established elite views that promote special group interests. This leads to the perpetuation of existing structures and policies that support these interests. Group interests can be ethnic, racial, economic, political, and other interests that concern decisionmakers in a society. The authors argue that individual citizens and the interests of other groups are often overlooked or even treated as opponents, setting up a situation of protracted division. However, alternative media, especially new internet media, are increasingly sought out for unbiased information that can lead to greater peace and equality. They examine the case in Cyprus, where political division along the green line has been the longest running peacekeeping mission of the United Nations. While they find reporting in established media on both sides to be more than 50 percent factual, they noticed that the biased reporting that exists tends to favor in-group interests and attack or ignore out-group interests, promoting an us/them view of the world. This article does not examine the behavior of media in other countries, and argues that this type of study should be conducted more widely with the goal of achieving less-biased news reporting and a greater cultural consciousness that reporting should consider the interests of average people, peace, and genuine democracy rather than primarily elite interests. While a content analysis of alternative media messages was not examined, the sheer volume of new media and social interaction on the internet reflects a reality that average people are increasingly going to it for information, whether it is considered reliable by elites or not. Globalization also can impact these less-developed areas in ways that increase violence and cause refugees. The formation of armies of conquest, like the Islamic State in Iraq and Syria (ISIS), are possible because of global recruitment strategies over the internet and alternative media. The possibilities of the global arms trade enables tribal warlords to obtain arms both legally from states they make alliances with and illegally through global black markets that have proliferated. These arms can either be used for peacekeeping or for conquest, and too often they get used for conquest even though they are originally provided by distant countries for the purpose of peacekeeping. Too often arms are made and sold for profit and the producers and distributors remain ignorant or unconcerned about their end use. Our second article is on the arms trade and the impact that globalization is making on local tribal rivalries in less-developed areas that do not have secure multicultural states. With respect to legal arms trade, the largest profiteer in 2010 was the United States with 30 percent of worldwide sales, followed by Russia with 24 percent, and Germany with 9 percent. However, in the last two decades, the illegal arms trade has emerged on the African continent and has also had a destructive impact in Africa’s Sub-Saharan region where conflicts among clans, rebel groups, and criminals have been worsened by it. 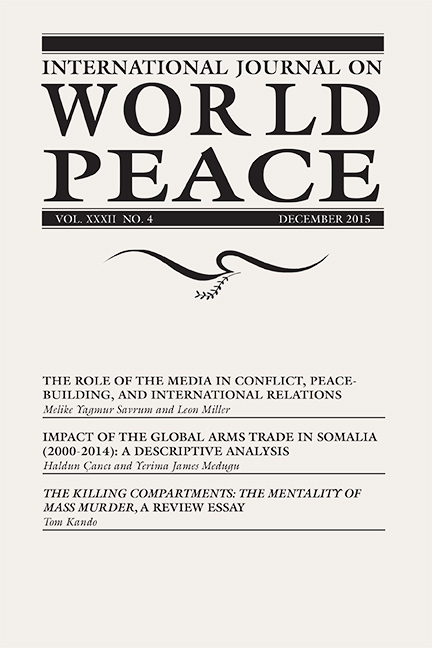 This article examines the situation in Somalia. Demand for weapons by warring groups existed before the Cold War and globalization, yet the fact of globalization enables arms to flood markets that previously had less access to them. Despite relentless attempts by international organizations to regulate arms flow, they have not fully prevented the heavy influx of weapons that find their way into Somalia illegally. In fact, the instability allows for the formation of new transnational groups like Al-Shaabab, which has parallels to Al-Qaeda and ISIS that have developed in areas where arms are proliferating and in states that are unable to provide basic security. Until the social conciousness promoting group violence underlying the demand for illegal weapons can be resolved and adequate state security created, legal regulations by the United Nations will accomplish little. The situation is complicated by the fact that arms manufacturers in Africa have emerged and shipments of arms do not go through any international ports. In today’s post-modern world, reality and perception have merged to create an atmosphere in which no concern is more prominent than concern about violence. Marshall McLuhan’s prediction has come to pass. The message presented by the media no longer distinguishes between myth and reality. Regardless of their frequency, terrorism, crime, war, and other forms of violence have become the uppermost topic. This has been achieved by the mass media, the internet, the social media, electronic technology, and popular culture (p. 59). We now have Al Qaeda, ISIL (the Islamic State of Iraq and the Levant), and other similar groups. The violence of such groups is rendered far more visible and spectacular by the modern social and mass media. Of course, mass murder has occurred throughout human history, but the organization of nation-states and advances in technology made genocides since the beginning of the twentieth century extremely massive, with large numbers of civilian casualties. The mass annihilation discussed by de Swaan is one-sided, whereby the aggressors are armed and organized, and their victims are defenseless. This form of violence has killed the most people of any form of violence—three to four times as many as war alone. Kando mentions “genocide,” “classicide,” “democide,” and “politicide” as some of the forms mass annihilation takes, depending on the type of group conflict that exists. Then there are psychological dimensions de Swaan has called “the Conqueror’s Frenzy,” “Rule by Terror,” “the Loser’s Triumph,” and “the Megapogrom.” If there is any progress in fighting mass violence, Kando suggests it is just beginning in the form of increased revulsion by mass media and increased embarrassment, rather than triumphalism, exhibited by perpetrators. Cultural consciousness and the formation of laws and social norms usually lags behind ecological, demographic, and technological changes. Hammurabi’s Code and the Ten Commandments likely reflect rules developed after centuries of conflict and social instability in the ancient Near East, just as the Glass-Steagall Act and the FDIC in the early 1930s reflect coming to terms with nearly three centuries of bubbles and financial speculation after the rise of modern corporations financed by stock purchases. It is easy to forget these lessons when times are good, as indicated by the repeal of the Glass-Steagall Act in 1999, and the corporate scandals like Enron, WorldComm, and eventually the 2007 housing bubble that may not have developed had that act not been repealed. We thus need to bear in mind George Santayna’s saying that “those who cannot remember the past are condemned to repeat it,” while also realizing that remembering the past does not help us with new social problems that develop from environmental and technological changes like the influence of the mass media and globalization on violence and peace. The Nobel Peace Prize for 2015 was given to the Tunisian Quartet who brought about a successful transformation of the society to a less oppressive regime in Tunisia. Yet the other places to which the Arab Spring spread have either become more dictatorial or have turned into failed states causing hundreds of thousands of refugees are flee, because it is not possible for citizens to survive where anarchy exists. Thus, we must not take the Nobel Committee’s praise for the Quartet in Tunisia as an endorsement of the Arab Spring in general. The uprising in Tunisia was spontaneous, with a Tunisian citizen so frustrated with his ability to live there that he publicly immolated himself. The masses in Tunisia could identify with his suffering and undertook a revolution, followed by a transformation of the Tunisian government led by the Tunisian Quartet, a coalition of civil society groups that came together in the summer of 2013 when Tunisia was at a crossroads between democracy and violence. Today, while there have been several violent incidents aimed at political leaders and tourists (tourism is the backbone of the economy) perpetrated by Islamists, the Tunisian state is relatively stable. The Tunisian transformation required a great deal of courage and compromise among established leaders in the country, and observers are cautiously pleased with the outcome. The “Arab Spring” was a different form of revolution. It arose after the changes spontaneously began in Tunisia. It was a product of youthful Arab idealism and global media that hoped such a change could occur in other countries. Youth throughout the world with the internet and smartphones were able to compare their life under local dictators and life elsewhere in the world. The idea of an Arab Spring also brought global media campaigns funded by wealthy individuals like George Soros, and foreign military intervention led by U.S. President Obama, aimed at toppling the dictatorships in Libya and Syria. Reforms in Libya, Egypt, and Syria all failed. These revolutions were inspired by events in Tunisia, but were orchestrated by well-intentioned outsiders more than being as authentic. U.S. President Obama supported fighter jet attacks on Libyan Dictator Muammar Gaddafi, who was found hiding in a culvert. This was reminiscent of U.S. President George W. Bush’s earlier attack on Dictator Sadaam Hussein in Iraq, who was also captured in an underground hiding place. Liberals in the West have been quick to point out the evils of the oppressive dictators and demand their overthrow, often in a knee-jerk manner that fails to include a plan for governance or willingness to provide security to the people who live there after the regime is overthrown. This has been the case in Afghanistan, Iraq, Libya, and Egypt. The West has prospered under constitutional government and free elections, and many wish other countries to have them, but these institutions took hundreds of years to develop. Between the fall of the Roman Empire and the signing of England’s Magna Carta, most Western regimes were dictatorial kings and princes that officially espoused Christianity. These systems of governance were very much like many regimes in the Middle East today that officially espouse Islam. The gradual distribution of political power to ever-wider numbers of citizens, and the acceptance of religious pluralism has been nearly a one-thousand-year process that has slowly civilized a formerly barbaric Europe. Increased acceptance of universal human rights and pluralism in the collective consciousness in the West is the result of changing cultural beliefs over many generations. Imposing these contemporary Western systems of governance with elections and religious tolerance on peoples whose collective consciousness has been largely a tribal identity, with no history of separation of religion, the economy, and the state, and expecting rapid results, has proven to be a relatively fruitless enterprise. One can create the best political system in the world, but unless the people living under it consider it legitimate, it will not succeed. From Russia’s invasion of Afghanistan in 1979 to Obama’s arming of Syrian “moderates” in 2014, the great powers of the world have missed the fundamental fact that nation-building requires several generations of political stability before it is known whether the grandchildren of the revolution will experience greater happiness and less oppression than life they will observe in other parts of the world. Part of the collapse of the Soviet system in Russia was a disillusioned younger generation who did not experience the freedom, wealth, music, and blue jeans they saw as they viewed their counterparts in the West. The Arab Spring revealed similar youthful comparisons to life under economic freedom and development in the West. And, like the idealism of the Russian Revolution, it was followed without the creation of a government or culture capable of delivering the economic development and wealth creation in the West. For the most part, the political and cultural vacuum was filled by backward-looking Islamists, or rulers who demanded greater loyalty and fostered greater oppression. The Tunisian revolution was unique in that the deposition of the dictator was followed by a coalition led by established domestic economic producers and human rights organizations. It did not take from the rich and give to the poor, undermining the economy. It did not accept the imposition of the values of one religious or ethnic group on all citizens. It was not an anarchy created by foreign disruption. There can be some hope for Tunisia because it reflects a transformation from what was to an improved and more humane society. It reflects a cultural consciousness more willing to respect the rights of all people than the previous system. The Nobel Peace Prize Committee can be lauded for recognizing the possibilities for greater peace and prosperity that the work of the Quartet brought to Tunisia. However, revolutions in the Middle East brought about with foreign meddling have had the opposite effect: oppression, increased violence, lawlessness, chaos, and failed states. Those revolutions have caused social instability that led to waves of hundreds of thousands of refugees fleeing their homelands. We did not see such massive flight from Afghanistan under Pres. Mohammad Daud Khan, from Libya under Muammar Gaddafi, from Iraq under Sadaam Hussein, or from a Syria under the protection of Bashar al-Assad, even though these regimes were oppressive and corrupt and operated like monarchies in the Middle Ages in Europe. Today it is ironic that Russian President Vladimir Putin, whose regime descends from the revolution that threw out the Tsar, and Iran, whose regime stems from a revolution that deposed the Shah, would argue to prop up the type of regime that their ancestors fought to overthrow. This action seems to fly in the face of what both the communist revolution in Russia and the Islamic revolution in Iran stood for. Yet these countries are perhaps learned enough from their own revolutionary backgrounds to realize that a corrupt dictatorship can provide more security than a failed state. Russia and Iran have been forced to live next to the failed state in Afghanistan ever since the Russian invasion that led to the creation of the Taliban much like the attempts to oust Hussein in Iraq and Assad in Syria led to the creation of ISIS. Now these and other failed states are adding to the waves of refugees flooding to Europe from the Middle East. It was Thomas Hobbes, the founder of modern political science, who argued that “the state of nature is a state of war.” The natural condition of people is to attempt to survive, and this leads to anarchy in the competition for the resources to live. The only way to escape this anarchy is to have a collective sovereign, a state that guarantees personal security and the protection of property. Charles Dickens drew comparisons between anarchy in Paris and oppression in London in his A Tale of Two Cities, arguably the best-selling book outside the Bible. There may be a reason for the power of his book: it conveys lessons learned about life under different types of political regimes and drives home the point that almost anyone who has experienced anarchy would prefer to pay unjust taxes to a corrupt dictator or see unjust income disparities than worry about losing his life, family, and business in an overnight raid by a gangster. The western argument against cooperating with Syria is that Assad is a butcher. Stalin was also a butcher, yet when Hitler attacked Stalin, Churchill opted to support him, as Stalin was the less dangerous of the two. There is nearly unanimous world consent that, given a choice between living in Syria under Assad in 2010, or under ISIS in 2015, the former is relatively more desirable, even if relatively miserable compared to life in Europe or the United States. Despite the oppressiveness of the Syrian regime, it was not Assad that caused the masses of refugees to flee Syria; nor is it the dictators in Iraq, Libya, and Afghanistan who are causing masses to flee from those countries at the same time. They are fleeing because their states are failed and the citizens’ lives, vegetable gardens, and shops are unprotected and subject to the whims of rebel groups, gangsters, and warlords. They are fleeing because they are unable to feed themselves and their families in such conditions of anarchy. One cannot help but conclude that the West’s fixation on economic rights, while ignoring the prerequisite rights to protection of life and property, is misplaced and misinformed idealism. It is doubtful that Russia will be able to succeed in nation-building in Syria any more than they did in Afghanistan because they are a foreign power with a foreign culture. However, the idea of stabilizing Syria under Assad and then transforming the society to a more humane one from within appears to be more sensible than arming moderate rebels and creating anarchy and further destabilizing the region, causing even more death and more refugees. If the goal is to move Libya and Syria from a dictatorial government towards a more humane and legitimate regime, then it is Putin and Iran that are espousing a more functional process for achieving those ends. The U.S. and much of the West, by advocating policy measures that remove a dictatorial regime and create anarchy, produce the opposite effect of what they desire. The refugee flight from failed states to the West can, from this perspective, be seen as an “Arab Spring” road to hell, paved with good intentions.